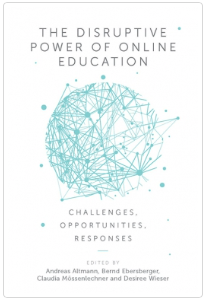 It is with a great pleasure that MCI Management Center Innsbruck announces the publication of “The Disruptive Power of Online Education: Challenges, Opportunities, Responses“. The book has been published by the Emerald Publishing Limited and is available as a hardback, e-book and a paperback edition. Andreas Altmann is the founding Director of MCI Management Center Innsbruck, Austria. His research focuses on university regulation, governance and management – including the competitive environment – and market behaviour in higher education and research sector. Desiree Wieser is a Research & Teaching Assistant and PhD student at the MCI Management Center Innsbruck, Austria. Her main research area and publication activity focus on higher education management, in particular on online education and the implementation of online education in higher education institutions. For more information, have a look at Emerald’s website.